Sams has been partners with Lindenwood University for many years. We help them get ready for the return of students and faculty as summer comes to an end, as well as take care of anything that may come up throughout the school year. We at Sams respond to any and all of Lindenwood’s carpet needs, like an emergency water leak or carpet repair. Lindenwood University has worked incredibly hard over the last number of years to achieve such high standards for a clean and put-together campus and we at Sams are here to help them maintain that standard. As summer begins to come to a close, Lindenwood University calls on Sams to help them get their housing units ready for the school year. This includes all of the dorms, apartments, and houses that Lindenwood has as housing options for their students. The University has approximately 600 units to prepare for the students and it usually takes about 4-5 weeks to complete the entire project. The Sams team is responsible for preparing all of the carpets clean and ready to go for the return of Lindenwood’s students. Lindenwood University calls on the Sams team for more than just carpet maintenance in the dorms. 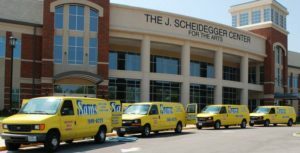 We take care of all of the buildings on campus that have carpet, including the Scheidegger Center for the Arts, Spellmann Center, Evans Commons, and faculty and staff offices. Sams also responds to any carpet needs Lindenwood may have at any of their other locations off the main campus, like in Wentzville and West County. Lindenwood University continues to choose Sams year after year to maintain their facilities for a number of reasons; one of which is that we are a local company. They know they can count on us to get the job done right. The Sams team is fully committed to Lindenwood at this time of year to help their facilities be the best they can be. Lindenwood isn’t the only university that Sams works with at this time of year. We help Maryville and Washington University prepare some of their buildings for the upcoming school year, as well. We at Sams are dedicating to helping our local schools and businesses shine for their students and staff. How can Sams help you with the carpet in your home or business this time of year? Contact us today and we’ll be happy to assist you!